Materials needed; 12" by 24" of MDF (1cm thick), acrylic paint, sandpaper, PVA glue and a brown leather strap of some kind, I used an old (not so) leather handbag strap! I did a couple of sketches of the sword from some reference images I found online. Once I was happy with my barbarian sword sketch I then drew out the design on some MDF. Using a jigsaw (this is a job for an adult) and a scroll saw I carefully cutout the sword outline, paying particular care not to take off any fingers! I then gave all the barbarian sword parts a good sanding around the rough edges. Now with all the hilt parts I mounted the cross guard and pommel using PVA glue and a couple of clamps as seen in image below. Now dried and clamps removed, I then sanded the cross guard making it seamless, I also gave the pommel a curved shape. The next job was to prime the sword ready for the final paint job. I used white acrylic as a primer and once dried I gave it a light sanding. I then mixed two shades of grey for the swords blade. This was done in two stages; lighter shade first (dried), then the darker which was marked out with masking tape. The yellow for the cross guard and pommel was next, I tried to match the same color as the infamous Clash of Clans barbarians bullbar moustache. Lastly was the hilt handle and luckily my wife kindly let me have a old handbag strap she had lying around. Starting from the bottom I stapled one end and wrapped around then stapled again once I got to the top. 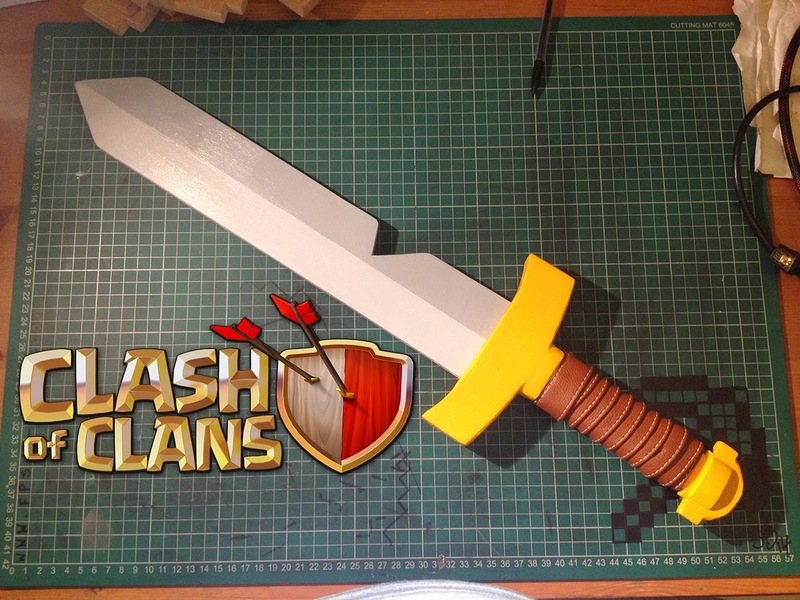 The YouTube video below will show you how I created my own Clash of Clans barbarian sword in easy to follow steps.